Cipher Glass Concept Knows What You're Drinking | OhGizmo! Oh man! If these were actually available I’d buy a whole set in a heartbeat! From designer Damjan Stankovic comes the Cipher Drinking Glass which is unfortunately nothing more than a concept at this point. 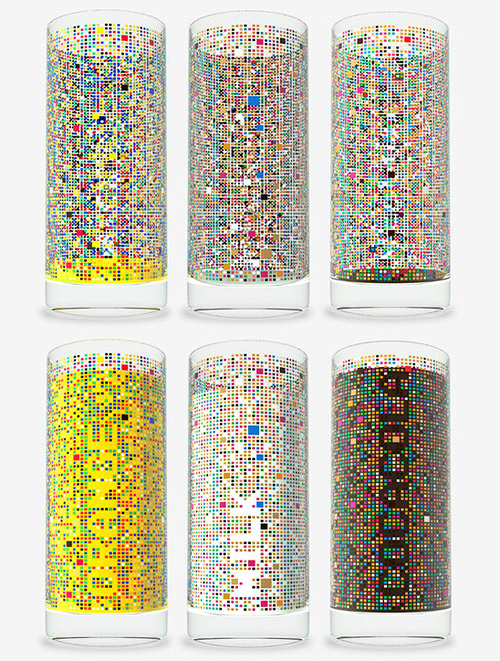 When empty the glass appears to be decorated with a pattern of random colorful squares, but when filled with milk, orange juice or cola the name of what you’re drinking appears on the side. It turns out that random pattern isn’t so random after all, and the different shapes and empty spaces work in conjunction with the color of the liquid to make it seem as if the glass is psychic. Is this so the waiter can remember what you had?